Any rough idea of how apneas and hypnoapneas differ? I'm trying to figure this out. An apnea you should hear nothing for at least 10 seconds. By definition there is no air entering or exiting since it's a total collapse of the airway. You'd likely hear a loud snore or snort when breathing resumes along with grunting, moaning, position change etc. With a hypopnea you're likely going to hear snoring, though not always. If there is snoring or heavy breathing it typically increases and increases until there is...sometimes...a loud(er) snore or snort. There really is no answer that is going to work for all scenarios and all people though. I've seen really bad apnea with no snoring at all. Not a peep. There is also very loud building snores with louder snores and snorts without any sleep disordered breathing (hypopnea or OSA) present. Sleep Medicine is full of grey areas! Ever sinced i gained weight in january, my sleep has been terrible. I also began snoring. I did do a sleep home study, the results came almost clean. 2 apneas on the side and 5.3 apneas, with a oxygen desaturation at it's lowest at 91. I sleept throughout the night, but was awake several times. Wouldn't that change the accuracy of the sleep study? Could snoring cause above symptoms? I'm in the process of getting a polysomography(but in the country i live it, it can take up to a year because of healthcare bureacracy). I have sounds like this going for me in sleep. I'm not really sure if it's a partial obstruction, or a full one. I go from snoring to like breathing like this. I'll sound like this, regularly throughout the night, in a bad sleeping position. I sleept throughout the night, but was awake several times. Wouldn't that change the accuracy of the sleep study? For sure. If you're awake during a home sleep study, that's a big problem. They assume everything is sleep. My company is the only one that I know of that utilized EEG for home sleep testing. This increases the accuracy of the diagnosis immeasurably. I'm still stunned that Home Sleep Testing without EEG is acceptable by Medicare. Horrible. Just snoring alone wouldn't cause any of those symptoms. At the most you'd have a sore throat, but just snoring doesn't effect sleep. The first one is just mild to moderate snoring. Sounds rhythmic. Doesn't sounds like awakenings from what I heard. Just prior to 2 minutes into the second sample sounds like an apnea or hypopnea. You can hear the breath getting cut off. Much of the time prior to that (skipped ahead a little) is just loud persistent snoring. I'd be really confident in saying that you did have an apnea at that one point. I didn't listen after that since it reminds me of work too much. What kind of hoops do you have to jump through to get a PSG in Sweden? Literally none, take a long long time to get one( at the very least 6 months, which is inhumane). Unless I travel outside of Sweden, the chance of getting a polysomnography is low. I'm planning on getting CPAP by myself, once I can confirm whether I have oxygen desaturations, I've bought high end pulse-oximeter for it, it should arrive this week. If it turns out I have crazy low oxygen desaturations, or any low oxygen desaturations, i'll just buy a used CPAP machine. Until now i'll just hold the fort by sleeping a way that is conducive to avoiding sleep apnea(I discovered that you can keep your airways largely open. The doctor who analysed my sleep study results, told me that it's likely I don't have sleep apnoea, based off the results. But I can't trust on home sleep study. That's a great question that I don't think anyone can really answer accurately. Too many factors involved (which your touch on). Here is a shortened down report from my oximeter. Can you give me an idea whether this looks bad? Thanks for your replies. I noticed 3 troublesome dips. Twice where it went dow to 89 for a brief few seconds. And once where it went down to 89-87 for 10-17 seconds. Would this cause any long-term/permanent harm? It's not good, but it's not horrible either. This could be caused by apnea or movement....or apnea and a movement. 14 isn't excessive by any stretch. I can't really say that there is any long term harm or not, but people hold their breathe for much longer when in a swimming pool etc. The level of Spo2 desaturation (to 87%) is usually the threshold where physicians start to take notice. That only happened once though and, again, could be movement related. Even if it's from an event it's not that frequent or severe in the grand scope. Hopefully that satisfies your question? If not.....fire away with some more! Hey, thanks for your answer. I did another oximeter run. This time with medical tape fastening the sensor. I had 3 dips into 89, none that went below 89. Each lasting 5 to 10 seconds. Would you say that is significant or insiginificant? If someone has had this condition for 5 months? Also where would you grade these desats? Sorry for the stupid questions, my brainfog doesn't allow me to parse text effectively. What i'm really trying to get an idea, is whether these would cause long-term brain damage and cognitive deficits, or the likelihood of that. I've had OSA for 5 months. The prospect of irreversible brain damage is fuelling my anxiety. Most physicians take notice when desaturations reach 89%. With just an oximeter you don't know what caused them. Could just be moving around in bed. I don't know about long term or irreversible effects. Many people have it for several years before having it caught. Try to not get too hung up on that stuff. Power-lines, cosmic rays, a bump on the noggin. Something is going to jack you up. 3 desaturations to 89% isn't anything to get worried about. None of your questions are stupid either. That's the whole point of this forum, to bounce ideas off of other people and hopefully figure this S#!t out. I've seen really bad apnea with no snoring at all. Not a peep. There is also very loud building snores with louder snores and snorts without any sleep disordered breathing (hypopnea or OSA) present. This is a very interesting statement because I have moderate sleep apnea, and I don't make any noise at all. I now realise I have had sleep apnea for about 14 years, but because I didn't have any obvious symptoms, it went undetected. Also, I am slim and quite young, don't smoke and rarely drink, so my doctors never considered I might have this condition. I read that in Europe and the US, there are estimated to be millions of people who have undiagnosed sleep apnea. There really needs to be more media coverage of this condition, to raise awareness. I never knew what sleep apnea was until a few months ago, although I had heard of it somewhere. When I was a kid I remember my dad used to stop breathing, and I thought he had died. Then he would start breathing again. He never knew he had sleep apnea, but now that I know what the signs are, I realise he had it too. There really needs to be more media coverage of this condition, to raise awareness. There is plenty of media coverage on it, but the way it's covered is HORRIBLE!!! On sitcoms is always portrayed as unsexy. Media comes in and focuses on the aspects of sleep apnea that are just "out there". There is sleep week. Lately attention has been on mobile apps that "detect" sleep apnea. Obviously they can't do that. They just measure movement in bed. But people that don't research this say, "hey, my phone says I sleep great." Or they focus on some stupid product. I'm sure this year they'll focus on the Airing. The media doesn't want to get into the meat and potatoes aspect of sleep apnea awareness. They want the sensational stories that are on the fringe of sleep medicine. If they want to get attention, they should focus on motor vehicle accidents attributed to sleep apnea. Something real that will garner real attention. The way media is now is just largely worthless. They come in every year. We'll try to steer them to doing a real story, but they always want to take it in some direction that is just stupid. Our own media relations people are right there along for the ride. Like they trained at the same Clown School/Media School. I can attest to the sleep trackers being inaccurate. I have severe OSA (72 AHI) and my Fitbit said I slept like a baby prior to my PSG. I threw it out. In Europe we have no coverage of it at all. Nothing. It's like it doesn't even exist. My experience is that people here either have no idea what sleep apnea is, or more often they confuse it with narcolepsy. Yet if you ask someone what the symptoms of hypothyroidism are, they'll likely you tell you all about it in detail, because there is lots of coverage of that, and posters about it in the doctors clinics. I have severe OSA (72 AHI) and my Fitbit said I slept like a baby prior to my PSG. I threw it out. Oh my God! Thank you so much. This is the video that I keep meaning to do and I keep forgetting. Now pen to paper so I don't forget again. Thanks Bronty! Treating apnea has a domino effect on other health problems. (in a good way) Diabetes management, weight control, hypertension all improve. In the long run it seems to decrease health costs when treated. My sister actually saw it happen with me. She said I stopped breathing and it went on so long she was going to hit me because talking wasn't waking me up. That was in September. 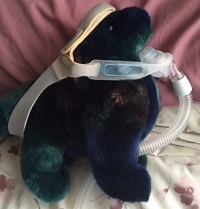 I just got my CPAP two weeks ago. I found and read this post and was wondering how Guyleft20 results with blood oxygen level on CPAP are? In the thread Guy, you were about 5-6 months out from getting a CPAP? Are you on CPAP now? What kind of SPO2 improvements have you seen? I have a wrist oximeter on-order and am also interested in how my SPO2 is gonna vary from a night of no CPAP, to a full night of CPAP. I check my blood pressure almost every morning. If I skip CPAP I am around 155/105(ish). After a night when CPAP works (no major leak issues, didn't take mask off while fully asleep, etc...) my blood pressure will be 148/96(ish). I am thinking the reduced SPO2 level is the major factor in bumping up my blood pressure. It depends on which Dr. I see, I have gotten my arse chewed by a few Dr.s about my pressure numbers and I refuse to take BP meds. Every couple years I stop being lazy and walk 15 miles/week, and start eating healthier and manage to drop 20 lbs and my BP gets back into more reasonable ranges. Then summer gets here, and I slip back into spending free time in the garden with a beer in my hand. And what goes better with beer than pulled pork, chips&dip and Ice Cream? Enough about me, Maybe it is in other posts that I haven't seen, curious how your results have been Guyleft20.